Promo Office is a job management module to compliment MyPromoSource (MPS) quoting platform. Promo Office is an automated job management software solution that allows MPS quotes to be transformed into a job and managed through to purchase order and pending invoices. Create purchase orders without double handling, manage job deadlines with ease using ETA functionality. Search functions include finding complete/current purchase orders, quotes and pending invoices. Sales Menu extras include Invoice and Delivery Docket Management plus CRM. Manage customer details and master customer information. CRM feature to keep track and bolster sales. Load quotes and manage sales orders. Manage the sales order/job. Manage the artwork. Manage products, purchase orders, decorations and suppliers database. 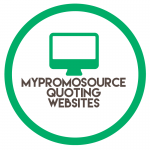 Learn about MyPromoSource Quoting Website integration.